Editor’s note: Anna Borshchevskaya is a fellow at the European Foundation for Democracy. You can follow her @annaborsh. The views expressed are her own. Later this month, the European Union’s Council of Ministers will decide whether to sign Ukraine’s European Union Association Agreement at the Eastern Partnership Summit in Vilnius, ten days later. If the European Union agrees to offer the Ukraine formal association, it will eliminate most barriers to trade between Ukraine and the European Union, and boost Ukraine’s economy. More importantly, the agreement would allow Ukraine to take a big step closer to Europe and away from Russia. It would be a historic shift. In anticipation of Vilnius, Moscow has increased pressure on Ukraine, Moldova, and other neighbors to join the Russia-led Customs Union. And, because a country can’t both sign an association agreement with Europe and join Russia’s Customs Union, Ukraine must choose. The Council of Ministers’ decision about Ukraine will come down to whether Ukrainian President Viktor Yanukovych will pardon former prime minister and political rival Yulia Tymoshenko, jailed since 2011 on politically-motivated charges. Tymoshenko’s imprisonment is symptomatic of the corruption, electoral fraud, and selective justice in Ukraine in recent years. Her release is not simply a matter of justice for one individual, but rather whether Ukraine accepts the most fundamental values of the community of democracies it wishes to join. Meanwhile, pressure from Russia mounts. Russia’s state-owned gas monopolist Gazprom demanded on October 29 that Ukraine pay an overdue gas bill. The demand carried a veiled threat of another “gas war” as Ukraine is almost entirely dependent on Russia for its energy. The move comes barely two months after Russia fired a warning shot across Ukraine’s bow, temporarily stopping Ukrainian imports at the border for increased customs inspections. 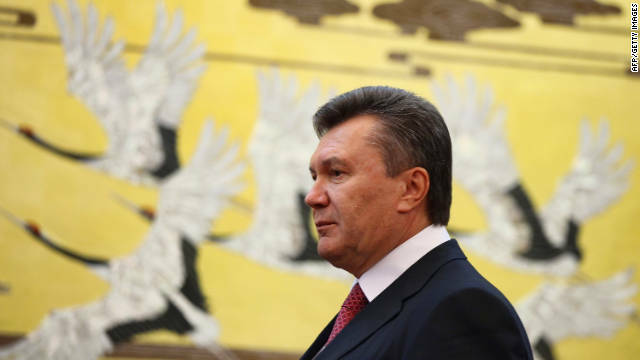 Yanukovych’s ambition may work in Europe’s favor – he may sympathize more with Russia than his predecessors, but he knows that if he chooses Russia over the European Union, he might lose the March 2015 presidential election. Of all post-Soviet countries, Ukraine is perhaps most significant to Russia. Historically, Russia draws its very creation as a state to Ukraine. The two countries share deep historic and cultural ties. For Russian President Vladimir Putin – who once famously declared that Ukraine is not even a state – losing Ukraine would be akin to losing a crucial part of Russia. And Ukraine may simply be the tip of the iceberg. Moldova could also initial an association agreement this month. During a trip to Moldova in September, Dmitri Rogozin, Russia’s deputy prime minister, warned that it would be “a grave mistake” for Moldova to seek European integration. Upon concluding his visit, Rogozin threatened to cut Moldova’s gas, on which the landlocked country is entirely dependent. “We hope that you will not freeze,” he reportedly said. The same month, Russia banned Moldovan wine, and for good measure suspended Lithuania’s dairy imports in October, even though Lithuania is already a European Union member. One country has already fallen victim to Putin’s bullying. Armenia, which appeared set to be on a European integration course after concluding in comprehensive trade agreement with the European Union in July, made an abrupt reversal in September and instead joined the Customs Union after a meeting between Putin and his Armenian counterpart Serzh Sargsyan. Putin probably made Sargsyan an offer he couldn’t refuse: Russia, with deep and multifaceted control in Armenia, is also the only guarantor of Armenia’s security, and therefore, was easy pickings for Putin. Yet for all of Putin’s bullying, and his recent diplomatic efforts in the Middle East, his actions only mask a weakness at home. Russia’s neighbors are resisting his pressure. As Vilnius draws nearer, it’s therefore important for the United States not simply to sit idle, but to use its diplomatic influence to encourage Ukraine and other East European states to look West toward Europe, to an alliance of democracies, rather than East, to Putin’s idea of a Soviet Union 2.0. I love it when you got a person who has no clue about the past present and historic ties between these countries write an article. Almost as good as the national inquirer! This is what happens when Western Poland becomes part of Ukraine. You got Western Ukrainians and or Carpathians in the government. They don't like Eastern Ukrainians and have divided the country. When in reality all the Western Union will do is strip their of their natural resources. Go Orange revolution...lol.....Trust your Kin in Russians. Roughly speaking you hit the core of the problem. Currently Ukraine is comprised of three parts with very different mentalities. South-east (Nikolayev, Odessa, Crimean pennsula, Donetsk, Lugansk, Dnipropetrovsk - put together the constutute about 40% of territory and 60% of economy) are either straight Russians or indentify themselves as eastern Ukranians leaning toward Russia. West (centered around Lviv) still remember the good old days of living as part of Austro-Hungarian Empire, when culture and fine arts were the meaning of life. They generally do not like Polland, but try to mix their language with Polish as much as you can to make it distinguisable from the rest of the country and claim that it is true Ukranian (as opposite Russian-Ukranian mix spoken by the rest). An the third part is the center-north (including Kiev). The problem with democracy in Ukraine is that no matter whom they elected, the remaining two-thirds will feel dominated by the elected regime who tries to control all aspect of life starting with who gets economic preferences, lukrative government contracts, an all the way to what language they are supposed to speak at home (or learn as kids in school). Naturally the two-thirds will be unhappy no matter what, occasionally revolting. Here is the solution: split the country in three parts by referendum. The West then can join EU or became a province of Polland (sorry, folks, Austro-Hungarian Empire with its blessings for fine arts is no longer available, EU is kind of its proxy ...sort of, but you have to get used to drinking coffee from coffee machine, rather than make it on sand-on-fire ceremony ...and forget than majestic delicious smell). The South-East can go to Russia and for a union of some sort. The Center-North then can elect Yulia Timoshenko by at least 80% votes (there are no spoilers) and enjoy her without going anywhere. Another one of my comments on brainwashing in the EU in reply to Andrey, vanished -CNN censors proving the very thing about our media that he wrote about. Only ignorant and naive may expect Ukrainian economy to receive any boost by joining the EU. In fact, just the opposite is going to happen- the economy will receive painful blows on multiple fronts and Ukiraine will be forced to beg on its knees for rescue from the EU. First of all, removing customs barriers will result in European goods overrunning the country, and consequent liquidation of whole industries domestically. Meanwhile, domestic exporters will see no benefit at all, as Ukrainian goods cannot compete in European markets. The only exports that may or may not see any increase is going to be commodities like grain. Essentially, the EU only wants Ukraine as a source of unprocessed agricultural commodities to ensure its own security in case of any global food crises. The EU plans to build its relationships with Ukraine just like with any other third world country and it is not something that will benefit Ukraine in the long term. It will be just like Africa- the eternal banana supplier- for the EU. Secondly, given the fact that the bulk of Ukrainian exports is destined for Russia, the event will result in immediate closure of Russian markets for Ukranian goods with devastating consequenses for Ukrainian economy. Thirdly, no more talk of special energy prices or preferential treatment from Russia. Ukrainian economy will receive a fatal blow from this side as well, given its absolute dependance on Russia for energy. Regarding Ukrainian language gaining precedence over Russian- that s another lie. I suggest the author should use more reliable sources or, still better, take time and visit Ukraine at least once to have some idea on the subject. Altogether, staying the course toward joining the EU will spell a disaster for Ukrainian economy both in the short and the long term. The ruling elites in Ukraine can only hope the EU is going to bail them out when the time comes to face the consequences but they may find themselves on their own in the midst of a fatal crisis with neither Russia nor the EU to turn to for help. Well put, Don. The Ukrainians need to stay neutral and develop it's own economy instead of joining the EU. Both the Americans and Europeans only want to exploit Ukraine's natural resources just like they're doing in Afghanistan and Iraq! Better to get away from the Russian yolk, Ukraine will thrive in the EU. And she will continue to be controlled by Putin if she does nothing. Ukraine will be exploited by either Russia or the EU...but it has to choose which one offers the best deal. Take a look at the standard of living in Customs Union countries like Belarus....vs an EU country like Poland. Both were in a similar state 20 years ago...but but now the EU alligned country has higher quality education, healthcare, and consumer goods. The customs union alligned Belarus is not a country where I would educate my children and if I ever got sick, I would pray to god rather than expect the doctor to help me. Ukraine and Russia build soviet 2.0, all Ukraine problem solved.